Flush the memtables to SSTables on disk manually with the Flush menu option in OpsCenter Node Administration. Performing a flush might be necessary before taking a backup, or when performance issues arise due to inadequate flush frequency. For more information, see the corresponding nodetool flush command. If OpsCenter role-based security is enabled, be sure that the permission for the Flush option in Node Operations is enabled for the appropriate user roles. From the Other Actions menu, click Flush. Tip: The Flush option is also available from the Actions menu in the Node Details dialog. Choose a keyspace to flush and click Choose. 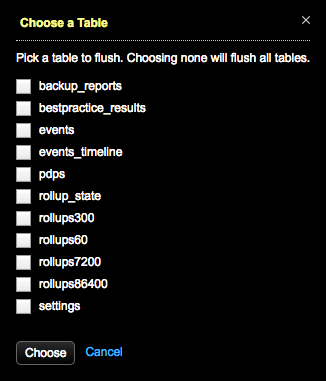 The Choose a Table dialog appears. Choose one or more tables to flush and click Choose. The Flush Node dialog prompts you to confirm the operation. A message in the top banner indicates the flush is in progress. Click the Show Details link to view the progress in the Activities page General tab. The banner message indicates when the flush is complete.